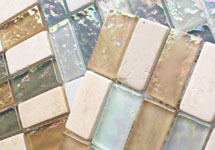 Combining the ethereal beauty of iridescent glass with the Old World feel of stone, the Emperia series calls to mind the splendor of antiquity. The natural stone mosaics are balanced perfectly by the captivating texture of the glass tile, which mimics the surface of water. The rectangular tiles are mesh-mounted in an aligned pattern, reminiscent of the clean lines of classical art.